A great day yesterday! A new camera (actually a smartphone, as not only the blogger's camera was suffering from dust, but so was his mobile) and a new turnout at Broadway. It's the last one, we are almost there now. The day started in great style. The mess coach was coming to Broadway at last. Traction was to be the class 20 D8137. The snow had melted again, but it was cold, minus 3 degrees. The class 20 lived in a nice dry shed and, having been pre heated, it started immediately. Here 's a little video of it outside the shed, an excuse also to try out the camera's controls. If it's a bit wobbly, promise to do better next time. Not enough fingers for everything you have to do, and it was freezing. Dimore moved off shed with a huge plume of steam, to position itself to haul the ECS to Winchcombe, where the Santa visits take place. Once that movement out of the way, we coupled up to the mess coach and tool van, and propelled through Toddington station up to Little Buckland LOO, then increasingly slowly over the recently stressed 1000m of CWR, over unballasted track and up to the top of the Childswickham Road bridge, where further progress was prevented by the extension train wagons, being unloaded and loaded again for removal on Tuesday. 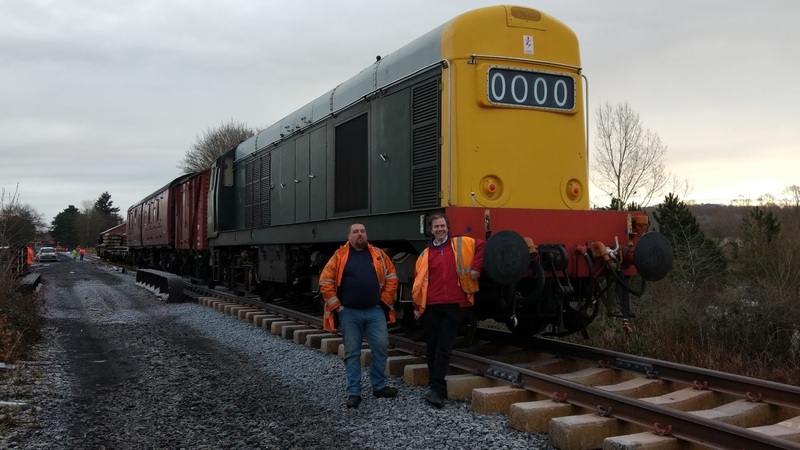 Gareth (second man) and Richard (driver) pose with D8137 on the Childswickham Road bridge, at the start of the Broadway goods yard. Never been here before. 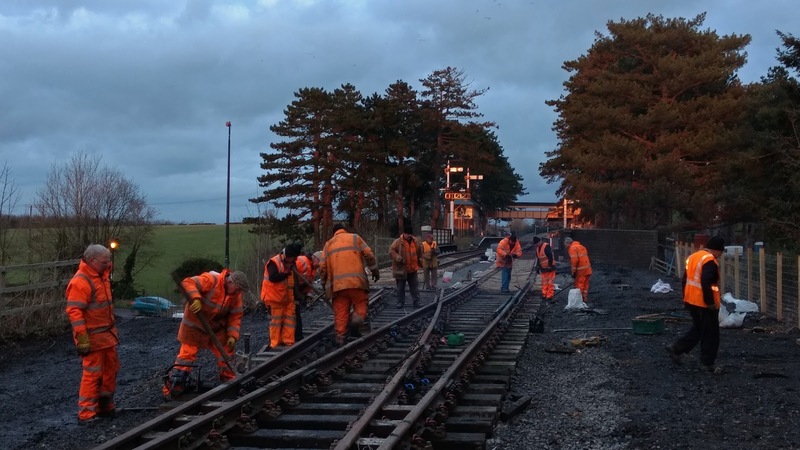 The ground was frosty still as we screwed down the brakes and shut down the loco, which would pick the train up again at the end of the working day. The train could be clearly seen from below, here looking east towards Broadway village. We hope it will generate some interest for our opening, now just three months away. The Class 20 whistling away to itself, the tool van and the mess coach parked on the Childswickham Road bridge. It was to be a warm base for the day for the PWay gang with frozen fingers. Tea and mince pies awaited us. Then, off to work. 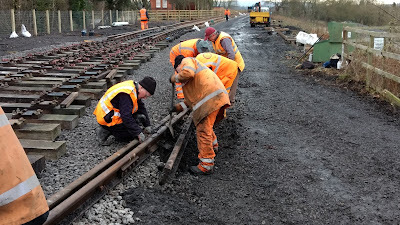 Last week (camera failure) we laid in the switches, which represent about one third of the work on a turnout. Everything was covered in frost. Although the timbers - here one is being brought in by Alan in the Telehandler - were numbered, you couldn't read the numbers as everything was white. As more timbers arrived, you could begin to see how the two tracks diverged. Here we are on timbers 29 and 30, out of 51 required. They were laid out roughly, then aligned and measured for distance apart. This has to be precise, and it was all written down before this turnout, from Laverton South, was taken apart and brought up here. As the two ends of the railway advanced towards each other the room for manoeuvering became scarcer and scarcer. Alan just managed to squeeze in here with the next timber, but now he's facing the wrong way. Someone move that Landie please! Ultimately the available room became too small for the Telehandler, so the next idea was to get Stevie to lift the timbers in. Made of jarrah and with 4 base plates, you can imagine the weight. There's no way we can move them by hand. Stevie found himself in an inceasingly awkward position, trying to get in as close as possible so that he could reach as far out as possible. The gate posts are now in the way. What gate posts? No problem for Stevie. With the positioning of the turnout here, the road up the embankment (indeed created by Stevie himself many years go) needs to move along a bit. The entrance on to the trackbed is now about 10m further south. Looking north you now get this magnificent view of double track right through the station, and disappearing out of sight to the left towards Honeybourne. 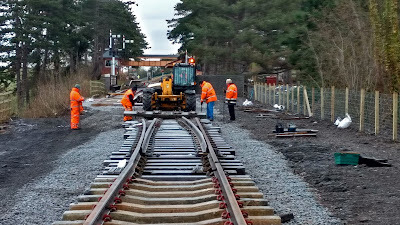 The whole thing still needs tweaking, remember that this is not the final position of all the track. Did we really lay all that in just a few weeks? 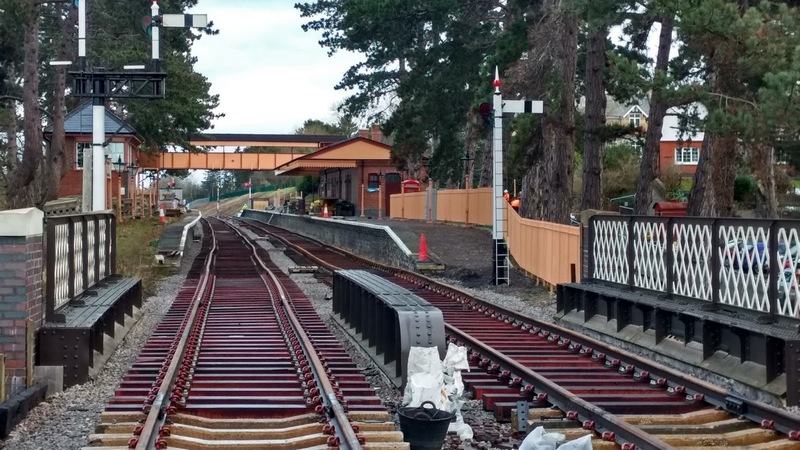 What a long way we have come: road bridge refurbished, station building erected, footbridge centre span put up, replica signal box constructed, 5 signal posts put up, over 400m of platform wall built. We're not quite there yet, but what an achievement already. 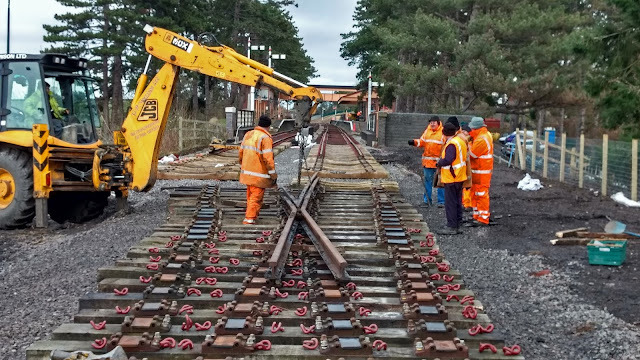 An email between two PWay oldies this morning mentioned that of course all this track had been laid by the younger ones, those under 70 years old. Yes, but mostly over 65 ! The chap with the umbrella held a pilot's licence and took several pictures of the nascent railway from above - we will put those up as well, during one of the dark winter evenings at home. 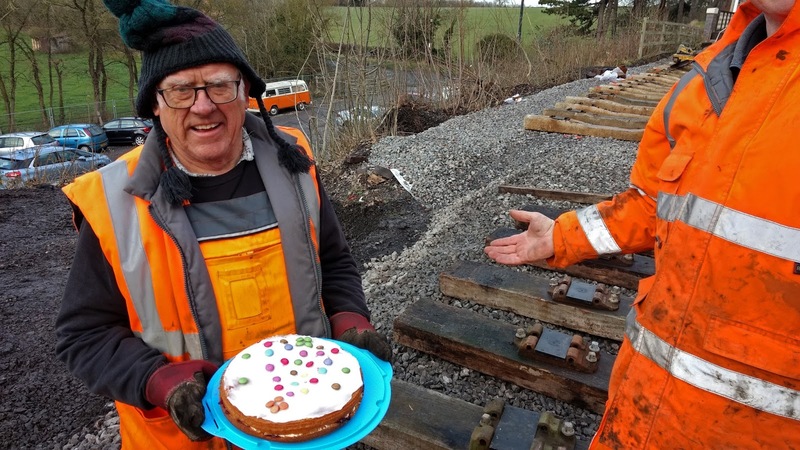 Well done John, still going strong! Then it's time to use that mess coach. You don't have to announce that twice, we all clamber on board in a trice. In side the atmosphere is warm and fuggy, it's all those kettles boiling and giving off steam. 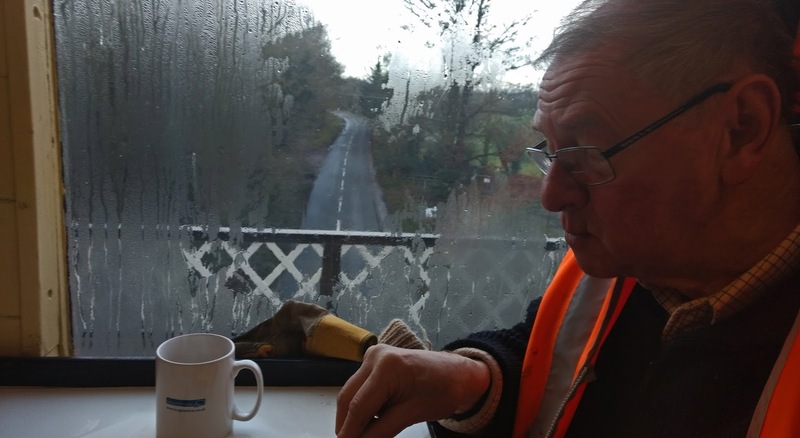 It felt like a real privelege to tuck into mince pies and tea while sitting on top of the Childswickham road. 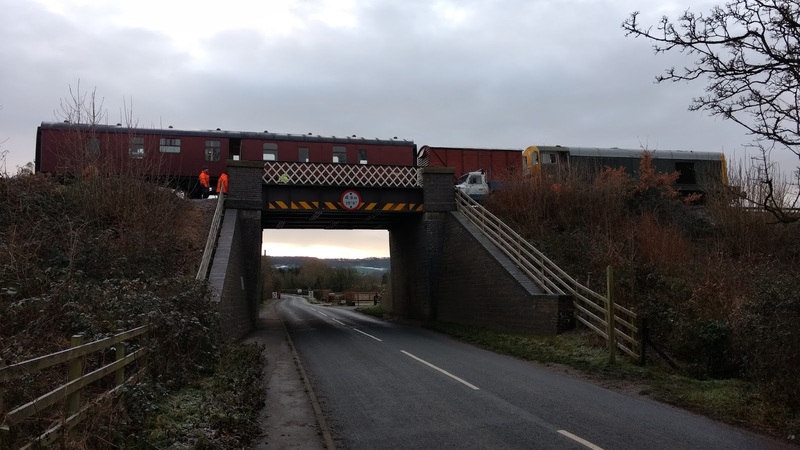 Wonder what all the drivers underneath thought of the new train on the bridge. 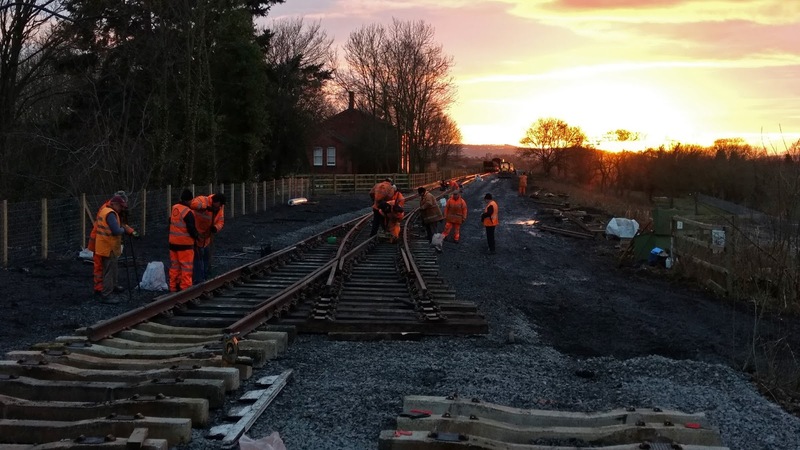 Broadway GWSR is coming! Next is an important piece, the crossing itself. This was dragged up from the far end, and on arrival was found crammed full of indescribable muck and ballast stones. Better to poke it out now, with shovels and fingers, before we lay it in. 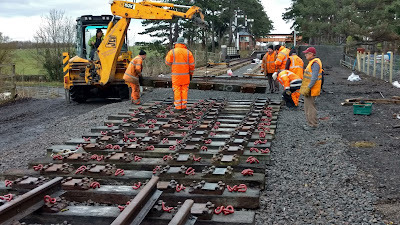 With the crossing cleaned up, we were in a position to lift it in, bit by bit. No, the concretes in the foreground are not for another turnout for that loop to the next bridge, they will be slewed over to the left. Pity though. Maybe next year. Here it is, pretty much in position. Now comes the tricky bit, which is to get it to sit on the base plates - not yet possible in this picture. There's going to be a lot more head scratching over which way the timbers have to be shifted to get everything to match up. Then it's just a short hop to the plain track laid in all the way through the platforms from Springfield Lane bridge, out of sight round the bend. 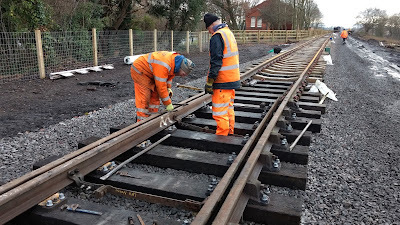 While we were working on the crossing in the middle, other teams were tidying up behind us - clipping up, drilling and fitting fishplates, or as in the picture here, with Steve and Pete fitting an insulated stretcher bar to the two switch blades. Mike proudly bears today's masterpiece down to the mess coach. For lunch Nigel produced Mrs. B's masterpiece this year: A juicy jam sponge equipped with a lucky dip of Smarties on top. When it was cut up, the fastest among us got a slice with four on, while the unlucky ones at the back got a slice with only one. Better luck next year, guys. Or, as Darwin put it, survival of the fastest. With the switch basically in, Steve could concentrate on laying the few extra concretes we need to join everything up. In the foreground are timbers 50 and 51. They're all in now, and the frost has melted so you can see where you are in the puzzle. 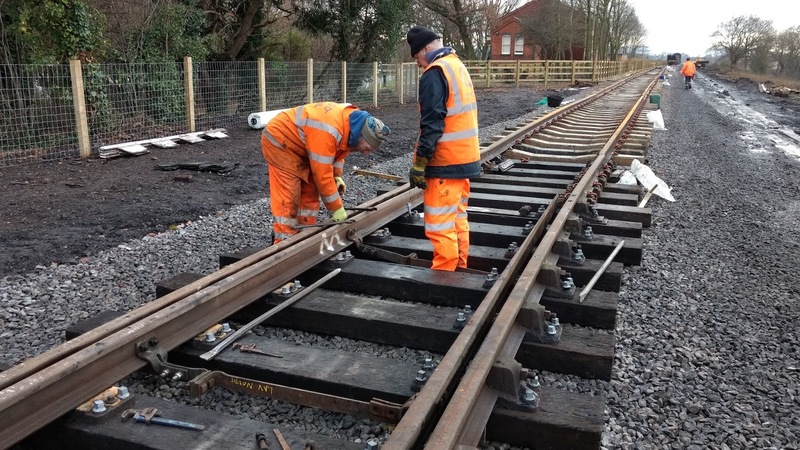 While a gang clips up the first check rail on the right, the second check rail is being brought in on the left. 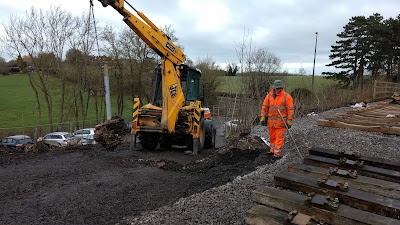 In the foreground Pete and Tony are fishplating the end of the turnout to the plain track at the southern end. As the light started to fail at the end of the day the turnout was basically in. We couldn't believe it ourselves really. What a professional team. The orange of the setting sun has caught the signal box windows and the back of the bracket signal. We're not quite there yet - we are still not connected to the plain track, and the whole caboodle has to move over to the Cotswolds side a bit. There's also a lot of clipping up to do by the goods shed, and more fishplates to fit. 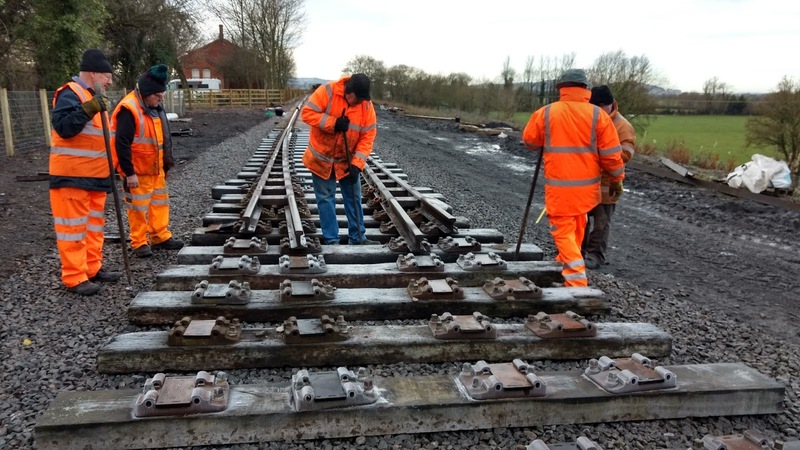 Plenty more to do then, but we are going to meet our promise of getting the track down by the end of the year. How's that for efficiency! Here's a view at the same moment - with the setting sun - looking the other way, towards the south. This is clearly a turnout now, but there's more still to do. The through road, leading from platform 1. Or the down line, as once was. On the left there was once a siding; on the right, the up line and a second siding on top of this wide embankment. As it was getting quite dark we packed up the tools and most left for home - back next Saturday, the 23rd. Three stayed behind to take the train home. Lots of atmosphere in the cab of the class 20, with Richard at the controls and looking ahead out of the window. The 'whistling wardrobe' crept along at walking pace until we were back on the operating section, and then opened the throttle under the road bridge - you have to have some fun ! The class 20 pulls into a lit but deserted Toddington station, to drop off the token before going on shed. What a great day we had. Same time next week, guys? What brilliant work ! What a lot you've got done ! It's amazing. You're amazing. All of you. Yes, I remember, you did say, in an earlier post, that you'd get it done by the end of the year, didn't you ? And yes, we all realise the work yet to be done to get the track into useable condition. But, oh my word, to sit in the PW coach on Childswickam road bridge ! What a sensation! I had no idea you had the PW train that far along. And with mess facilities. Including A CAKE ! Glad you made it, (over what must at the moment be a very wobbly bit of track, ) safely back to Toddington, of course. But I suppose you know we all look forward to seeing the PW train at Broadway. On the Evesham road bridge. That will be a sight ! Go on. You're doing wonderfully. And I can see that nothing will stop you. We've been watching the progress of the extension from our back garden for the past year and are thrilled to know it won't be long until we see the culmination of the amazing job you've all been doing. Hats off to you all. Roll on Good Friday. 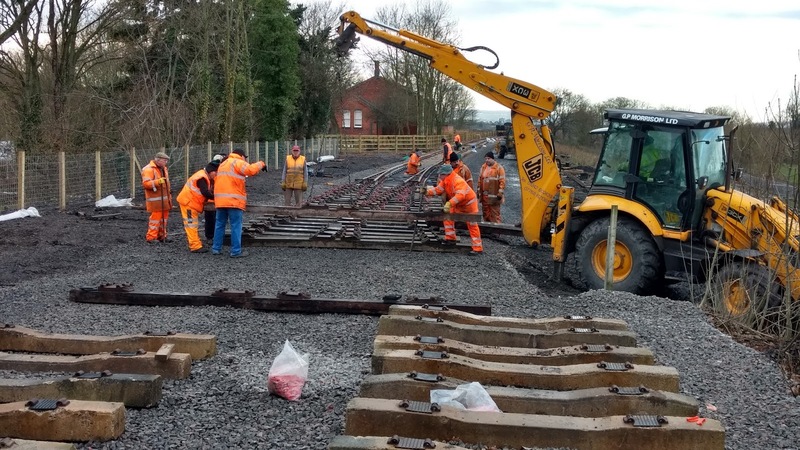 seen the timetable for Broadway Easter weekend only a few thru trains to Broadway any ideas on a dmu shuttle service to toddington otherwise with the crowds it could become a struggle any ideas on this not long to go now..🍴CAFE.? Hourly departures from Broadway during the opening weekend doesn't look too shabby to me? All trains running look like they go to Broadway as well as far as I can see, it's never missed out. 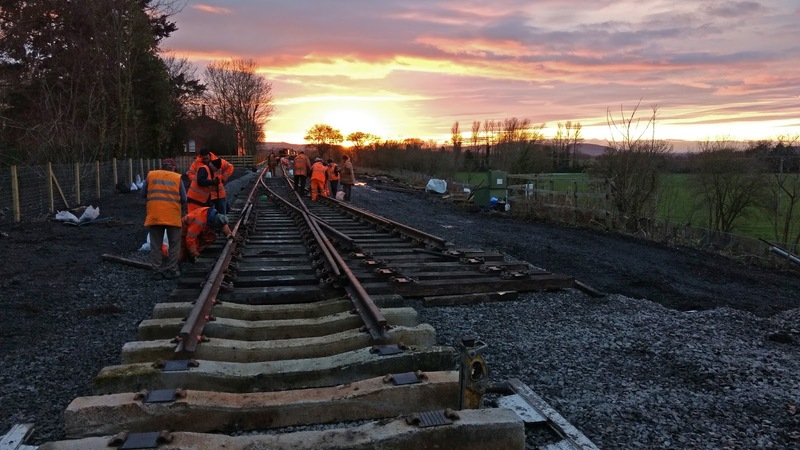 Also worth remembering the single line section between Toddington and Broadway is very much the longest of our single line sections so Toddington to Broadway will always be a pinch point. Double track, or a passing loop perhaps? I don't know of any restrictions on double track over the viaduct. It's always passed its inspections with flying colours, and I've never heard about any issues with the condition of the structure. As I recall, when the present single track was laid over the viaduct it was positioned in the centre of the trackbed to distribute the dead weight of the track, and stresses and vibrations of passing trains, evenly through the structure. That's common sense while the single track is in place, but it doesn't mean double track is forbidden. I don't know why there should be an issue with train doors if double track was laid. The Great Central Railway has been running Mk 1 stock without central door locking over its double track for some years now, without any problems. At 25mph the regulations are pretty relaxed. If you want to go faster, then it all gets a lot more strict - although even then central door locking is not necessarily mandatory. 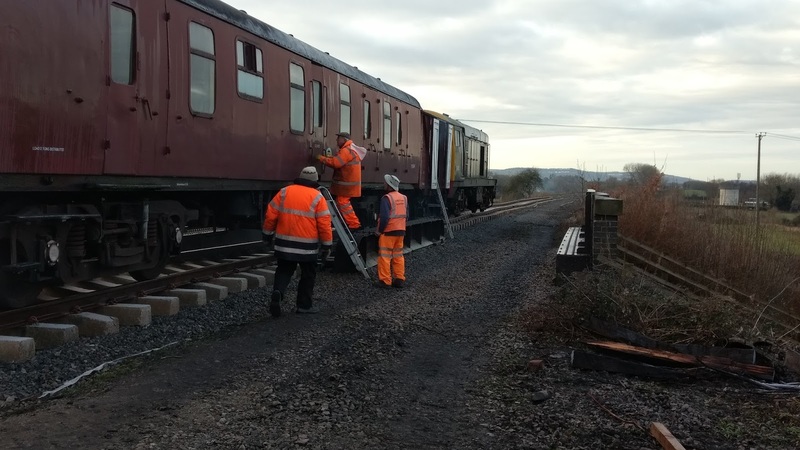 Charter train companies run Mk1 and Mk 2 stock without central locking on the national network, with extra staff on board to make sure nobody messes about with the doors. The NYMR also does this on their trains over Network Rail's tracks between Grosmont and Whitby, and I suspect a similar stipulation will apply to the North Norfolk Railway, when they start their services to Cromer. 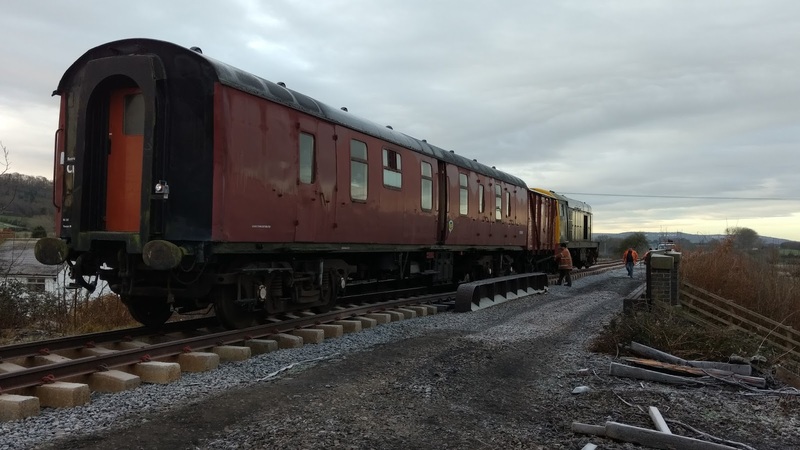 (The Swanage Railway is currently using a hired-in 4TC Mk 1 set on their trains into Wareham, which has been modified with central locking). So there are various ways to do it, but in short - doors aren't a problem, and neither is double track. 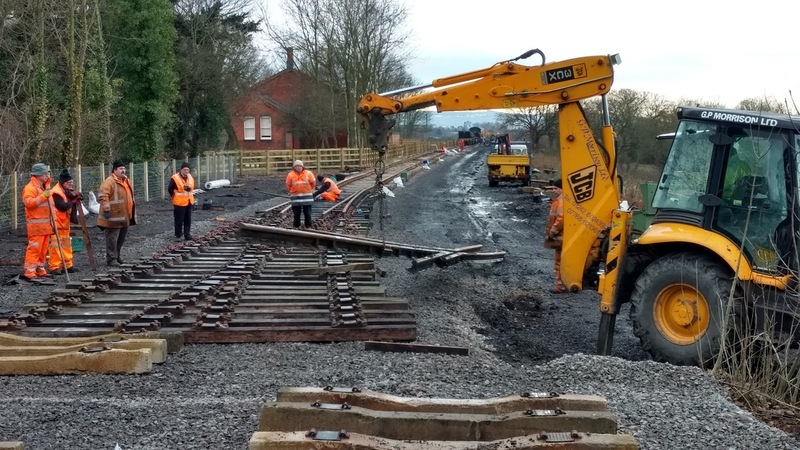 I don't think the capacity of the single track between Toddington and Broadway will be a problem anyway. In the near-ish future, when Broadway is fully complete, it'll be possible to accommodate two trains in the station at once. 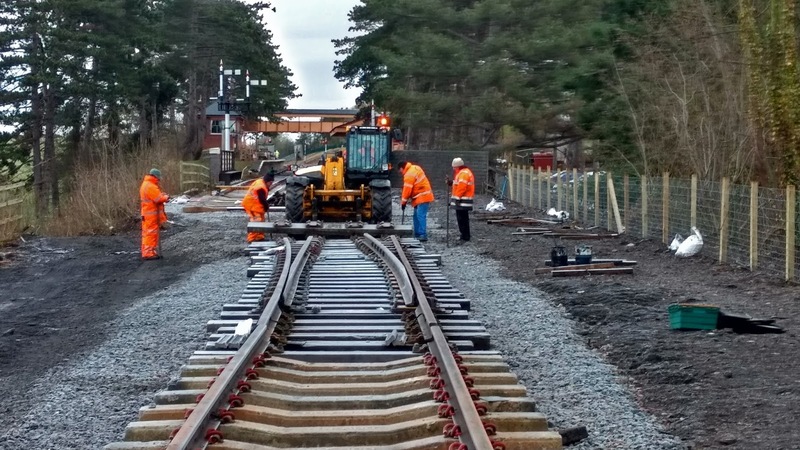 A southbound train will be able to set off immediately the arriving northbound train is in the platform. This kind of quick turnaround will make the most of the line's capacity. I think it'll be enough. After all, on a typical day it's usually only the mid-morning to mid-afternoon trains that are really busy. Thanks for the reply, for some reason I had it it my head that trains running on the "edge* of a viaduct, as opposed to down the middle if you see what I mean, needed secondary door locking. Pleased to hear that's not an issue, not sure where I got that from! When I last travelled on a NYMR train from Grosmont to Whitby, earlier this year, the guard locked all the coach doors for that section. It might have been due to insufficient staff to monitor each coach but the doors were certainly locked for that part of the journey. You are quite right about the positioning of single track along the centre line of the viaduct; much less stress on the structure. 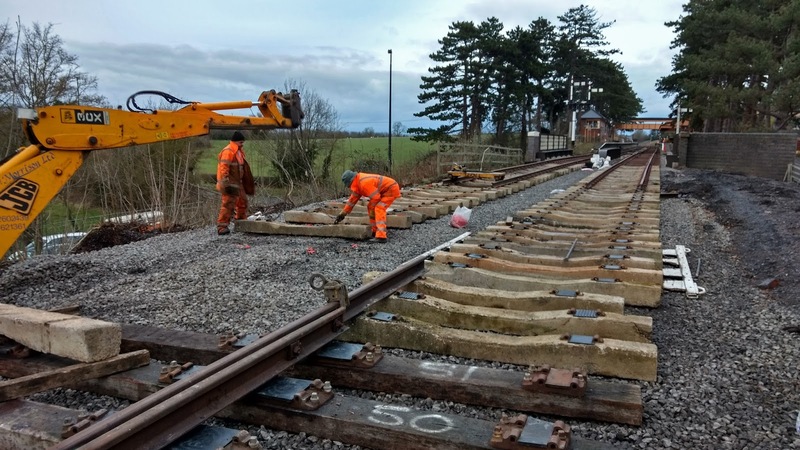 It's all academic for the foreseeable future anyway as the cost of completing the Broadway extension and the other projects underway or planned for the GWSR will soak up any spare money. Toddington Ted. Yes, on my last trip on the NYMR there weren't enough staff on board the train to monitor all the doors, all the time - so a couple of people ran (literally, ran) up and down the train for the entire Grosmont - Whitby journey. It was frankly rather annoying, and probably rather hazardous in itself. I remember thinking at the time that there must be a better way. 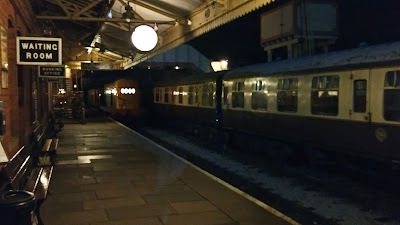 The bizarre thing is, the NYMR stock had been fitted with bathroom door-style bolts on the inside of the doors, which presumably satisfied a requirement for the doors to be locked from the inside (otherwise the built-in locks, accessible from outside with a carriage key, could have been used). But because there was nothing to stop people simply shooting back the bolts and unlocking the doors, they still had to be monitored by staff. So as a door-locking solution, the bolts were pretty much useless. Still, I guess they ticked the right health 'n' safety box for someone. A central locking method was developed for Mk 1 stock a few years ago, which basically relies on an electro-magnet hidden in the door step. The external door skin is extended down to cover the step, so that when the electro-magnet is energised it holds the door shut. The big advantage is that there are no moving parts, so there's very little to go wrong. 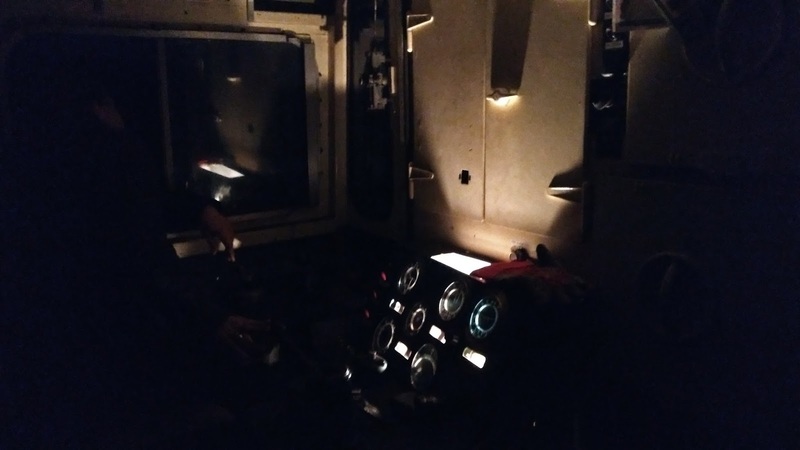 The disadvantage is that the system needs a constant supply of electricity to keep the doors locked - not a problem on a DMU or diesel-hauled stock, but steam hauled stock would need a generator on board. The other drawback is that the extended door skins very obviously change the appearance of the carriage. 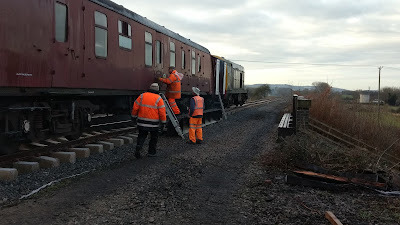 Here's a photo of a Mk 1 carriage with magnetic central locking, showing the extended door skin, lengthened to contact the electro-magnet hidden in the step. Note also the small round 'door unlocked' light between the two windows - these are ridiculous little LED things which are barely visible when lit. Whoo Hoo! 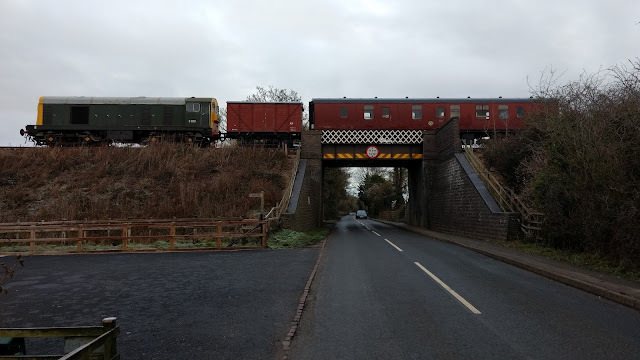 my monies is now on the Class 20 to be the first Loco into Broadway, Picture 14, a view from the Mess coach along Station Road, that's got to be a first!!! Well done the PW Department, another milestone passed! Yes, I agree, that really will be a special event ! 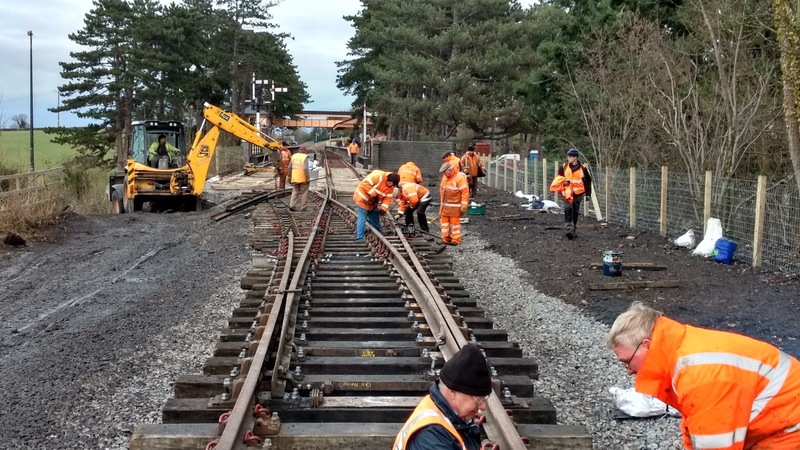 Let's all remember the PW team whose job it will be to make the track usable up to Broadway. 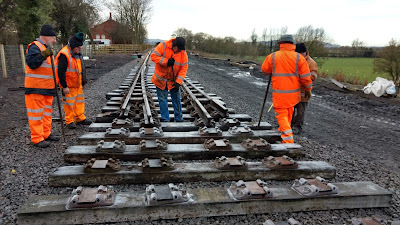 What with ballasting, fettling, and I don't know what else, this last stretch may prove the hardest grind of all, especially at this time of year. So much depends on the weather. One heavy fall of snow, and things could grind to a halt for days. And even if there is no snow, there will always be that "chilly" wind. (Is "chilly" quite the right word, or should I have used a stronger word ?) Do you remember the balmy days of June, and all that sunshine, when you would be tempted to take your jacket off to cool down ! Frankly, I really couldn't see how you could do much work during the winter months, but you're doing it regardless. It seems there's no stopping the PW team. Go on, brave men, and let's see a picture of the PW train on the Evesham road bridge. Spot on Mr Wright, an excellent comment. The bad winter of 1962-63 started in earnest on Boxing Day 1962 and snow didn't go until early March 1963. Let's hope we don't have one like that this time! 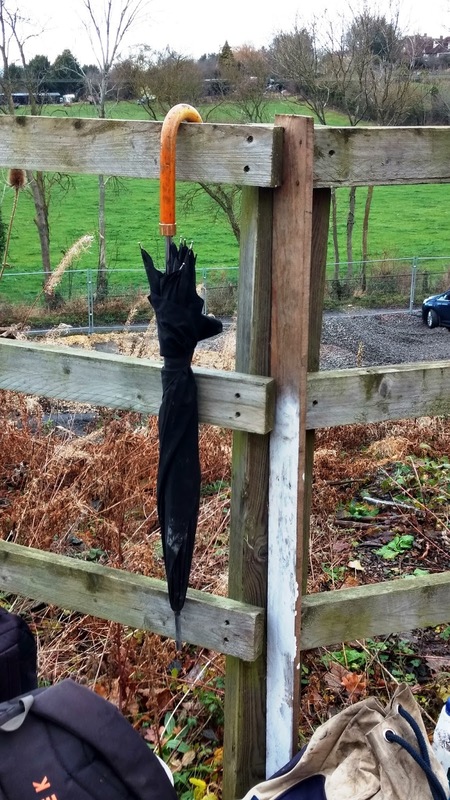 Even if it's mild, there is stuff-all daylight and everything is damp or running wet. Most mammals hibernate but you people are an inspiration. Toddington Ted. Well, Toddington Ted is absolutely right about the weather. Let's hope the worst doesn't happen. Of course, I realise it's a long way to the Spring, but with regard to the terrible winter of 1962, and, before that, the winter of 1947, both those winters were atypical, in their severity and long term effects, but both were well under way before Christmas. Meanwhile, we have had two particularly warm summers, long, hot and dry, in 1959 and 1976, from June to October. So, you never can tell ! This winter, so far, we aren't doing too badly. I suppose we can only hope . . .
Jo, Great work to you and all the team, i echo everyone else's comments, well done! I know you guys have a lot to do, but, we've all been hinting at it, is there a chance of laying a couple of panels on the cotswold side by the bridge and between the caravan park. Make it look like a siding and hook up a turn out later next year? Let's hope there's no prolonged snow. So much of what's necessary to finish before March is outside: welding, ballasting, tamping the track, installing ground frames by the PWay team. And having a safe platform and station entrance for passengers by the BAG. Toilets and ticket sales can be temporary arrangements I guess. 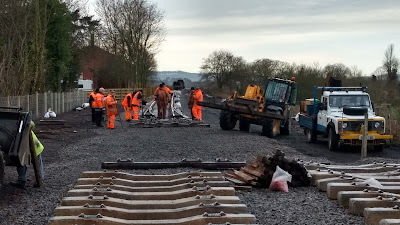 Car parking will mostly be down at Toddington, I assume, so pedestrian access is all that will be required initially?? The station team is pulling out all the stops to get the toilets and booking office ready for the opening.